The Kite Runner is one of the few books published in recent years that are set in the Afghanistan. These books tell the world about the Afghanistan, its natives, the decades of warfare the country has seen and the devastating effects of it. A beautiful place with nature’s beauty and bounty in abundance that men have ruined for gaining short-sighted political ends. The story takes off with two boys Amir and Hassan growing up in the Afghanistan of 1970’s. Amir, son of a wealthy merchant who is a formidable man, lost his mother when he was born. He is a boy with inclination to reading books, reciting poetries and talent for writing stories himself instead of interest in sports and physical pursuits as his father would like. Hassan, a son of their servant Ali who belongs to a minority community group of “Hazras”, is a tough and loyal boy who serves as Amir’s friend, companion, servant and stands up for him in all the street fights and gets him out of all the tight corners. For Hassan, Amir is his best friend and he loves him very dearly while for Amir, Hassan is a servant, a companion to play with when no one is around and someone to envy because of the liking his father shows for Hassan. On one winter day of 1975, Amir and Hassan take part in the famous Kite Tournament of Kabul and Amir wins, but to complete the victory they need the kite that Amir cut last in order to win. Hassan is the best “Kite Runner” in Kabul and he chases the kite. Amir goes after him, but finds Hassan with the kite and a bunch of bullies in an isolated alley. And instead of helping Hassan, instead of standing up for him, he just witnesses the terrible humiliation Hassan goes through to get his dear Amir Agha the kite. When the bullies leave, he goes to Hassan and they come home together. But Amir can’t forgive himself. He is happy that he has pleased his father for the first time and has become an apple of his eye, but his conscience is heavy. He turns insomniac while he watches Hassan ostracizing himself. After a while, Hassan tries to reconcile with Amir but he instead gets him convicted for stealing from his room and Hassan leaves with his father Ali. Years pass, Amir leaves Afghanistan with his father and comes to America . He gets into good college, studies well, gets himself a wife and watches his father die but the guilt is still heavy on his heart. After almost 2 decades of living in America , he gets a call from Rahim Khan, a dear friend of his father, asking him to come to Pakistan . Rahim Khan tells him about Hassan’s life, how he never stopped loving Amir and considered him best of friends despite of knowing that he was present in that alley, watching but not helping. But Hassan is dead now and so is his wife, both killed by Taliban. Their son lives in an orphanage. Rahim khan asks Amir to go to Afghanistan and get the boy so he can put him in an orphanage run by an American couple in Peshawar . But Amir is reluctant. It is then that Rahim Khan tells him a truth. So, what is this truth? Does Amir finally learn to stand up for what is right? Does he take this chance to redeem himself? Does he go to Afghanistan and get the boy? A gripping emotional thriller with an ability to involve the reader in the fascinating journey of characters through inner and outer turmoil. 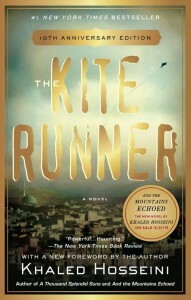 Khaled Hosseini talking about “The Kite Runner” and other stuff. It is worth to note that based on the critical acclaim and popularity earned by the book, it is made into a feature film with the same name. Here is the trailer of the same. Have you already read this book? How was your experience? Do share your remarks and thoughts via comments below. Does this review help you in making your decision to buy or read the book? Do not forget to share this article with your friends over various social networks via Twitter, Facebook, Google Plus and others. And yes, you may like to subscribe to our RSS feeds and follow us on various Social networks to get latest updates for the site to land right in your mail box.